We sell it by the 100 round pack. CCI CCI30: Spotting CCI shooters on the range isn't hard. Look for tight groups or cans with several holes in them. Regardless of the target, CCI ammunition delivers. If you're competing, "decent groups" just won't do. That's why CCI offers a full line of ammunition designed for those in competition like 22 Short, Maxi-Mag TMJ, 22 Long, Mini-Mag, Green Tag, Pistol Match, Standard Velocity, Select, and Short Target.Whether you're shooting a rifle or pistol, CCI have a high-performance load for you. CCI is the premier manufacturer of rimfire ammunition. Their classic Mini-Mag ammunition has a 40gr FMJ projectile with a muzzle velocity of 1235 FPS, perfect for the target or competition shooter. Manufactured to the highest specifications, this ammunition features CCI's ultra reliable primer ignition and cleaner burning propellants to keep your action cleaner and improve accuracy and performance. The .22 LR is a one of the most popular rounds in America, recognized for its versatility and low cost, used for hunting, plinking, competition, and self defense. 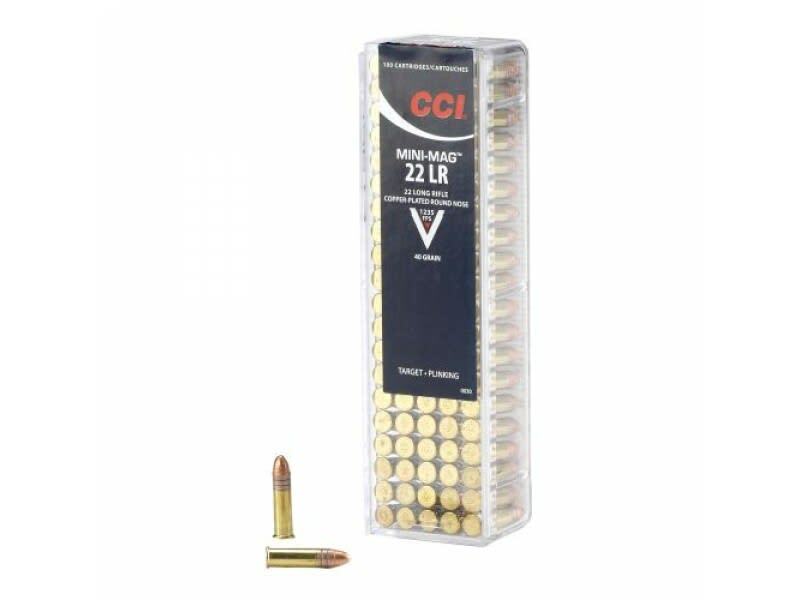 A gold standard of the .22 LR market is the CCI Mini-Mag, a high velocity load renown for its speed and accuracy. Whether it be a Ruger Buckmark, Walther P22, Ruger 10/22, or dedicated .22 LR AR-15, every household in America should have at least one .22 firearm. The low recoil increases the fun for new shooters and the low cost makes all day range trips affordable. 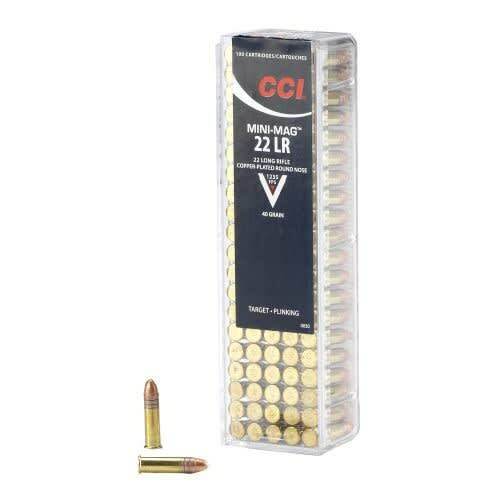 To keep your firearm functioning to its fullest potential, stock up on this great ammunition from CCI. Packed 100 rounds in a reusable plastic box with dispenser lid.